After the Dutch rolled through their first 4 matches at the 2018 Rabobank Super Series without a loss, on Sunday, in the championship match in Eindhoven, they ran head-on into a peaking Russian team, who stopped their momentum with a 3-2 win. In the 3rd-place competition, Italy beat Turkey 3-1, winning comfortably after shifting back to their top lineup. In front of a crowd of 2,000, for what was a glorified friendly and World Championship tuneup, the championship match saw wild swings before Russia eventually cleared the tie-breaking 5th set to win. After winning the first two sets with some ease, Russia let the Netherlands back into the battle, as the Dutch took the next two frames to force a 5th tie-breaker. In that tie-breaker, the score rose to 14-12, which seemed like a sure Dutch win with all of the momentum, the serve in the hands of setter Britt Bongaerts, and at least 2 match points to play with. Bongaerts’s serve was out, however, and Russia took the next 3 points after that to seal the match. The Netherlands, who has had a 3-blocker rotation in place, reverted to Yvon Belien and Nicole Koolhaas in the starting lineup, leaving the semi-final hero Juliet Lohuis on the bench. They also gave Anne Buijs back her starting position at opposite over Celeste Plak. But the comeback began when a group of reserves, including Plak at opposite, Lohuis at middle blocker, Britt Bongaerts for Laura Dijkema at setter, and Kirsten Knip at libero, were subbed-in in during the 3rd set and sparked the comeback. That leaves head coach Jamie Morrison with some head-scratching decisions to make about his team heading toward the World Championships later this summer. The aforementioned Lohuis had 4 aces, with the 21-year old showing off her X factor in the spot for starting time at a crowded, but still unsettled, lineup in the middle. Nataliya Gonchorova led Russia with 20 points on 16/37 hitting, while Irina Voronkova had 12. Russia: Korolev 11, N. Goncharova 20 (attack 16/37), Startseva 3, Fetisova 6, Voronkova 12 (attack 11/31), Parubets (captain) 16 (attack 13/20), Talysheva (l), Krotkova 1 , Romanov, Lyubushkin 1, Small 4, Kotikov. Did not play: Galkina (l), E.Efimova, Kutyukova. Italy has alternated between starting their top lineup, including 19-year old opposite Paola Egonu, and their reserves in this 5-match tournament. 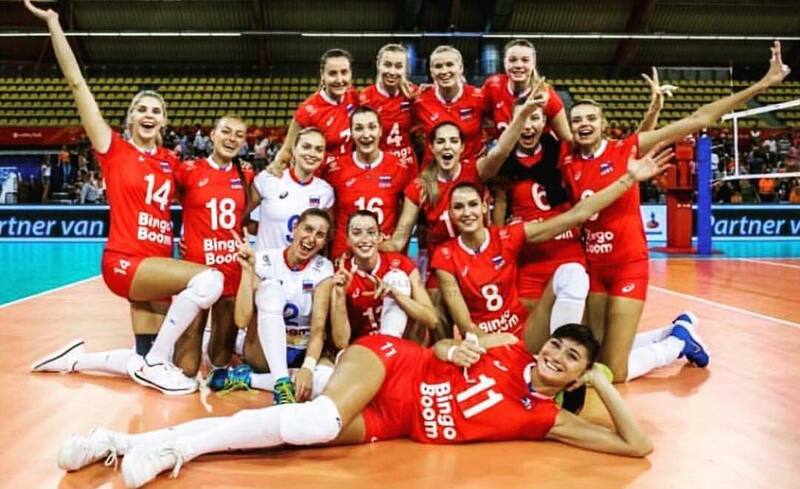 After the backups were handled thoroughly by Russia in the semi-final on Saturday, Italy played their starters on Sunday and, aside from a 3rd-set hiccup, rolled through Turkey in the 3rd-place match. The Italians finished the day with a dominant 4th set that took them only 20 minutes to complete. Egonu again led the team in scoring, this time putting up 18 points ahead of Anna Danesi and Lucia Bosetti, who each had 14. Egonu finished off both the 1st and 2nd sets with kills, but struggled in the 3rd set – as did Italy as a team. Elena Pietrini saw most of the time at outside hitter in service of Miriam Sylla in that 3rd set, and she came away with 10 points for her efforts, but the team was not rewarded. The Italian middle block of Anna Danesi and Cristina Chirichella dominated Turkey’s hitters. Italy out-blocked their opponents 12-3, leaving Turkey’s Italian-born coach Giovanni Guidetti in fits on the sideline. Italy also had 13 aces to 8 for Turkey. Bronze medal match: Italy – Turkey, Rabobank Super Series tournament in Eindhoven, The Netherlands (no sound in time-outs and between sets).